It’s no secret that my heart belongs to Nearpod, Socrative, and ThatQuiz.org. That being said, another web-based formative freebie has joined my top-three-tools. Kahoot! is a game-based quiz show platform that can be used with any content area with ease. I tried my first Kahoot! yesterday with 8th graders who will take their Math STAAR test later this week. Students had previously worked problems from the 2013 released Math 8 STAAR test on paper, and entered their responses in ThatQuiz where I’d prepared an answer-entry “quiz”. That way, students received an immediate report from ThatQuiz on their efforts, and so did I. To prepare for Kahoot! 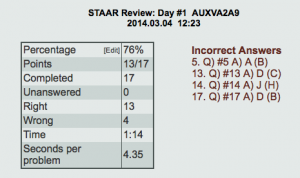 I used the data from ThatQuiz to choose 12 released STAAR questions that students missed often. After using my favorite Mac shortcut (command-shift-4) to take screenshots of the 12 STAAR problems, I uploaded these images to Kahoot to serve as the questions, and made the four answer choices A, B, C, or D… or F, G, H, or J. In Kahoot, I set the time limit for each question as 90 seconds. Students had their STAAR paper problems and work handy as the Kahoot review began. The suspenseful music set the tone for some stiff competition, ha! Students each entered a PIN generated when I initiated the Kahoot to start, as well as their names (their REAL names… this must be stressed with middle schoolers so as not to get names like BigBoySwag and such). Each multiple choice problem appeared on the big screen as students used their iPads to choose the final answer. If you haven’t experienced Kahoot… it’s all about how FAST students enter the correct answer. In turn, they earn up to 1,000 points in Kahoot currency per problem. Since students had worked the problems previously, some were able to ring in quickly… but were these quick responses ALSO correct? Not always – after the last student entered his/her answer choice, the timer stopped, and a bar graph instantly revealed student progress. We discussed each problem in depth before moving forward. 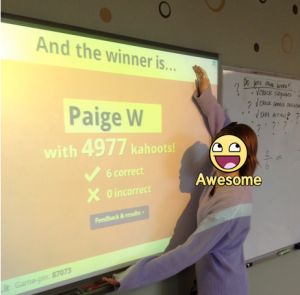 Then, the part they love the most – as I clicked “Next” a leaderboard showing the top five students and their respective Kahoot points motivated everyone to keep going. Great fun! 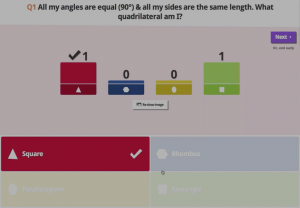 I wish Kahoot allowed zooming in to the images within the Kahoot quiz, as the screenshots I’d uploaded were quite small on the big screen. In this case, it wasn’t a big deal since students had paper copies in front of them. For future Kahoots, I’ll have to be careful about the readability of images on the screen up front. An aside on Kahoot philosophy – sure, it would be easy to have the problem statements on students’ screens, but Kahoot is careful not to have a classroom full of zombies staring at iPad screens. Having the problem statement appear at the front of the class keeps folks facing forward and looking up, more aware of their social surroundings. I like this a lot. Another fun fact – our middle school did a school-wide Kahoot through our in-house student TV network, and we had nearly 400 students competing in a Kahoot about Texas history. The questions were broadcast through our TV network, and students across the school rang in responses on their iPads. It was amazing to see that Kahoot could handle such a large audience of participants with ease! Want to see Kahoot in action with teachers? Here’s a great post by Clay Reisler (@recessduty) with videos included! I had the pleasure of meeting the creators of Kahoot! when they stopped by my classroom after the SXSWedu conference. So glad to have found this web-app! Give it a try! Here’s a very clever video. Here’s a cumulative “quiz” I designed and use annually as part of our STAAR review. This entry was posted in Algebra 1, Pre-Algebra and tagged assessment, formative, Kahoot!, nearpod, review, Socrative, thatquiz.org. Bookmark the permalink.